Squat spherical earthenware bean pot (a) and lib (b); turquoise-blue ground and vitreous glaze. 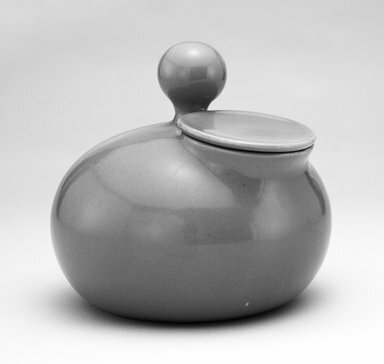 Pot rises at top to continuous spherical knob in center; round opening or "spout" with pulled up sides cut out of top collar portion alongside knob. Flat round lid with rounded edges fits this opening. CONDITION: Good; some manufacturing imperfections including small unglazed spots around body and some raised flecks of clay on knob and body.